In this issue of Vietnam Briefing we explore how Vietnam’s Free Trade Agreements - and especially those via its membership in ASEAN - will affect foreign investment into Vietnam. We then examine the specific, bilateral Double Tax Agreements that Vietnam has enacted, and how these can be further used to minimize profits and withholding taxes that would otherwise be levied upon foreign investors. This holds true both for investors establishing a presence in the country, as well as contract manufacturers looking to outsource. Finally, we look at how Vietnam’s rules of origin are key in trade with China. In 2015, Vietnam comes under the investment spotlight as the country moves towards its goal of ASEAN Economic Community compliance at the end of the year. When this occurs, the full extent of the tariff reductions negotiated by ASEAN – of which Vietnam is a member - will kick in. This will have an immediate impact, especially with respect to Vietnam’s bilateral trade with China, its giant neighbor. The ASEAN Free Trade Agreement with China will be fully enacted in Vietnam on January 1, 2016, with the elimination of both import and export duties on some 90 percent of all goods traded between Vietnam and China. ASEAN also has a similar agreement with India, with whom Vietnamese bilateral trade can also be expected to massively increase. 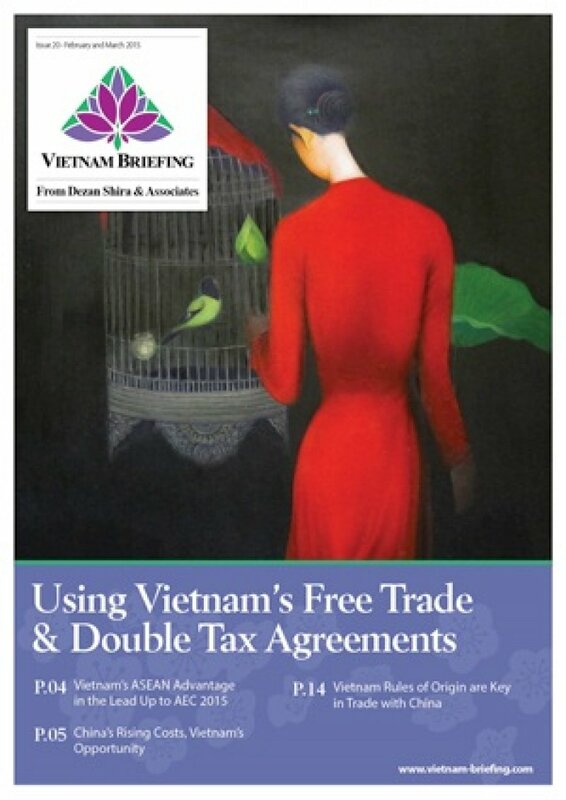 In this issue of Vietnam Briefing we explore how Vietnam’s Free Trade Agreements - and especially those via its membership in ASEAN - will affect foreign investment into Vietnam. We also go a step further and examine the specific, bilateral Double Tax Agreements that Vietnam has enacted, and how these can be further used to minimize profits and withholding taxes that would otherwise be levied upon foreign investors. This holds true both for investors establishing a presence in the country, as well as contract manufacturers looking to outsource. Finally, we look at how Vietnam’s rules of origin are key in trade with China.